Cave Creek runs through part of this World Heritage listed area. It eventually falls into the unusual cave formation of Natural Arch in which countless glow worms are found. The boulder strewn creek bed is testament to its volcanic origins. I found this project interesting because of the bright greens due to the strong sunlight catching parts of the scene. The water was challenging due to the contrast of fast flowing and still water. This is my second pastel painting, and the first time I have attempted to depict water. 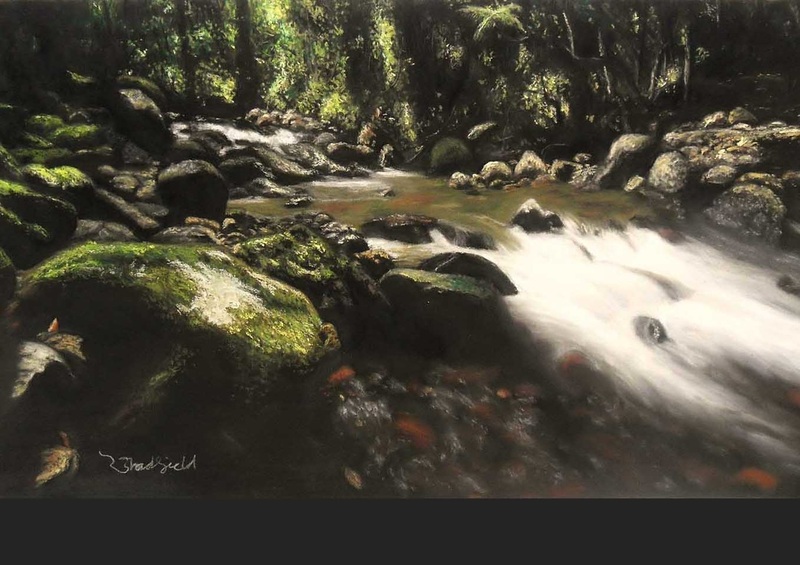 This painting depicts a typical rainforest floor found deep in Lamington National Park, one of the many reserves that comprise the World Heritage listed Gondwana Rainforests. The composition highlights the contrast between the bright colours of the bracket fungi and ferns with the decomposing logs. This reflects the connection between the living and the dead. The fungi, moss and lichen assist in breaking down old organic matter and provide nutrients for the new. These nutrient cycles are vital for sustaining biodiversity and life throughout the Caldera. Nankeen Kestrels are relatively common in the caldera region and occasionally seen hovering over cane fields, grasslands or open woodlands. They prey upon insects, small birds, reptiles and mice; hunting by sitting in a tree or power line watching for prey. They hover distinctively over open spaces, before dropping rapidly onto prey. They are usually seen alone or in pairs, but can be in loose flocks of up to 30. ​Nankeen Kestrels nest in anything from tree hollows to cliff ledges and even though they are not endangered, these beautiful birds should not be taken for granted. There are 5 species of owls with facial discs (or masks) in Australia. This is an adaptation to make their hearing more acute. The Barn Owl, when in flight, appears ghostly white and screeches rather than hoots. They need tree hollows to shelter and nest. Installation of artificial nest-boxes in trees within agricultural areas (especially in cane fields) in some parts of Australia has increased Barn Owl numbers with the resultant reduction in pests such as rats. In the meantime, consider sparing that big gum tree in the backyard, it may be sheltering Natures most calculating self-setting rat-trap. Imagine you’re walking along a beach at sunset with your dog off the leash, running excitedly ahead into a flock of resting birds. The silhouette of the birds in flight makes for a picturesque scene. These migratory wading birds have flown thousands of miles across land and sea to get here. Once in this region, they need to rest and feed to store up fat reserves for the return flight back to the northern hemisphere to breed. They roost and feed in sensitive shoreline habitats which are unfortunately disturbed by recreational vehicles, dogs and people. White-bellied Sea-eagles Haliaeetus leucogaster form a pair bond for life and are often seen together. This pair are at Clarrie Hall Dam, a favourite haunt. They also relish coastal habitats, as do humans, who have modified it to suit themselves much to the detriment of this species which is the second largest Australian bird of prey. To assist with the survival of this species, it has been listed nationally under the Environment Protection and Biodiversity Conservation Act and we need to ensure they have a place to live by preserving habitat. At over four metres tall, these single stemmed grass-trees Xanthorroea australis are at least 400 years old. The trunks are black and gnarled with age, while the sprays of wiry blue-green leaves are generally more showy in younger specimens.These two ancient ‘wizards’ stand guard high on The Pinnacle in the Border Ranges. Historically, the brown glassy resin that exudes from the trunks was used in timber varnishes. The long spear-like flower spikes with masses of minute pale blooms appear infrequently and are a favourite food source for a variety of birds in particular.